This Novelty Skull Ashtray is made from durable resin material. It is complete with two grooves on the edge for you to rest whatever is it you happen to be smoking. High quality and Intricate Details. 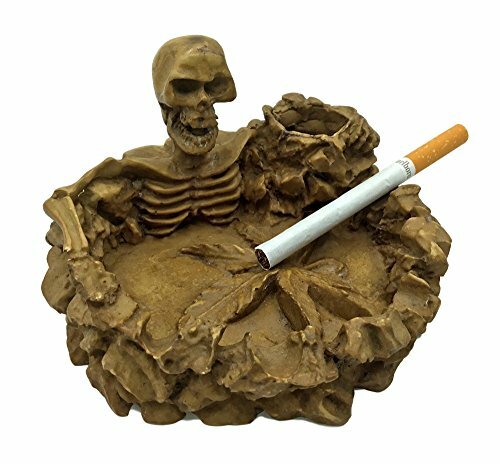 High Quality Durable Resin Material Skull Ashtray with Excellent Carving. Unique Gothic Style, Funny, Eye catching and Usable. Makes a great show piece too. Has High Detail Marijuana Leaf Carved in the Center. Size:5"X4"x1" Portable. Three Grooves on the edge for resting Cigarettes or Cigars. Help Nepali Artisans. Fair Trade Item. Makes a Great Gift. If you have any questions about this product by Bohotantra Collections, contact us by completing and submitting the form below. If you are looking for a specif part number, please include it with your message.